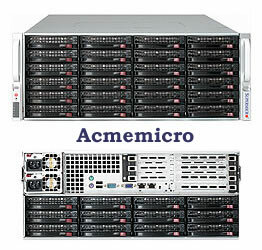 Acme AGD-436TFR 4U Opteron 6200/6300 storage server. Included 3ware SAS RAID Adapter 9690SA-8i to control 36 SAS/SATA hard drives. RAID 0, 1, 5, 6, 10, 50. 4U RackMount case with Redundant 1400W power supply (80 PLUS Gold Certified). 36 of 3.5" HDD bays, SAS/SATA hot-swap, backplane included. Width: 17.2 in. Height: 7 in. Depth: 27.5 in. * can upgrade to 4 PCI-e x8 slots.